From Tel Aviv, Zola reminds the viewer that Israel is a safe, thriving country. Despite the media’s efforts to portray it as a battleground, this little nation is a secure, efficient democracy in which deserts bloom and God’s Chosen People await His coming. When God chose Israel as His people, He not only placed them at the crossroads of history, but also at the center of the empires of their times. Time, and again, this little country has endured siege and upheaval, destruction and exile, only to rise from the ashes and start anew. 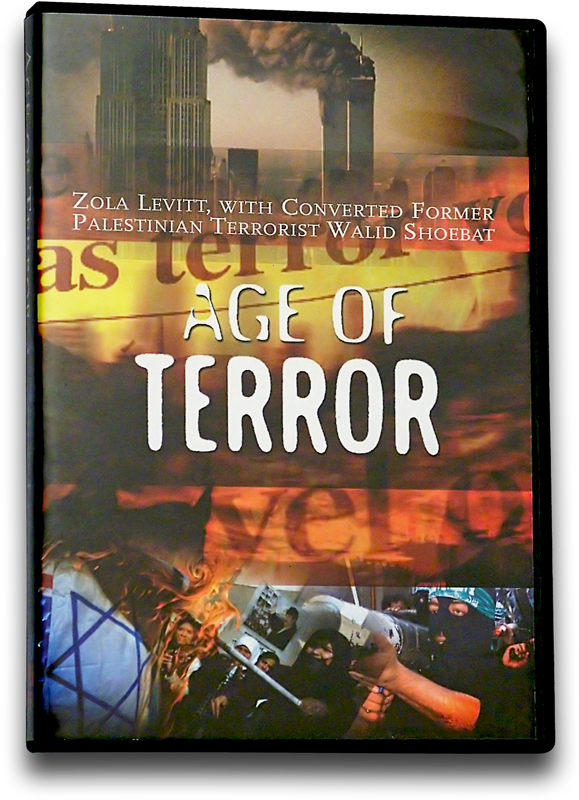 In this series, Zola is joined in the studio by Walid Shoebat, an ex-Muslim terrorist who was born in Bethlehem. Walid provides unique insights into the world of terrorism and sounds a clear trumpet of warning concerning the days ahead. His testimony of faith is poignant and his view of Biblical prophecy commands attention. 00:34 AND WALID SHOEBAT IS WITH US >>AGAIN AND HE WILL COMMENT TODAY. 00:41 AND A LOT OF BEAUTIFUL PLACES IN >>ISRAEL YOU NEVER SEE ON TV. 00:50 BUT DON'T REALIZE EXACTLY WHAT'S GOING ON AND THAT'S THE IDEA OF >>PALESTINIAN CHRISTIANS. 00:55 MANY PEOPLE SUPPORT THE IDEA OF PALESTINIAN CHRISTIANS, WANT TO >>HELP THEM AND SO FORTH. 01:06 AND HIS UPBRINGING OVER THERE AS >>A PALESTINIAN TERRORIST, NOW A BELIEVER IN THE LORD. 01:14 WE'LL BE GOING TO LOCATION IN TEL AVIV. 01:26 EVEN EUROPEANS AND PROBABLY EQUAL TO ANYTHING WE HAVE IN AMERICA. 01:31 IT'S A CITY OF OVER A MILLION PEOPLE, BEAUTIFUL BUILDINGS, >>WONDERFUL WATERFRONT AS YOU SEE. 01:37 BUT, IT'S BEEN KEPT A SECRET. 01:42 AND NEVER SEE THIS CITY OTHER >>THAN COVERAGE OF SOME TERRORIST >>EVENT OR SOMETHING LIKE THAT. 01:58 AND IT WAS SO BITTER, AS IF IT'S >>SOME KIND OF PERSONAL INSULT THE PRESIDENT WAS REELECTED. 02:06 THE CNN NEWSCASTERS SEEMED UTTERLY SHOCKED AND VIRTUALLY ALMOST DEPRESSED. 02:12 SOMEBODY SAID JUDY WOODRUFF WAS NEARLY IN TEARS WHEN SHE HAD TO ANNOUNCE THAT OHIO WENT TO BUSH. 02:19 WELL, ALL I'M SAYING, THEY ARE LIBERALS AND THEY DISLIKE BUSH. 02:30 OF THOSE WHO WILL CALL GOOD EVIL >>AND EVIL AND EVIL GOOD. 02:34 PAT BUCHANAN, AMONG NEWSCASTERS >>IS EXTREMELY ANTI-SEMITIC AND I KNOW WHEREOF I SPEAK. 02:56 SIMPLY THAT ISRAELIS GO AROUND >>AND KILL PEOPLE, ETC. 03:00 THE POLITICAL CORRECTNESS TOWARD ISLAM IS A SIGN OF THE COMING TRIBULATION. 03:07 IT REALLY IS AND THROUGHOUT THIS >>SERIES, WE'RE GOING TO BE MAKING THAT POINT. 03:10 THE PALESTINIANS COME UNDER THAT HEADING AND THEY GET THE FAVORED >>TREATMENT ON AMERICAN TV. 03:24 BASICALLY BACKWARD ISLAMIC TRADITIONS AND MURDERERS. 03:29 THERE WAS AN ATTACK ON A >>SHOPPING CENTER HERE IN TEL AVIV >>A FEW YEARS AGO. 03:48 AND THE FELLOW SET OFF HIS BOMB RIGHT THERE AND THE GUARD WAS KILLED. 03:53 SECURITY GUARDS HAVE GIVEN THEIR LIVES MANY TIMES IN THIS COUNTRY. 04:17 GIVE ME AN ESTIMATE HOW MANY >>DIED IN THAT TERRORIST ATTACK ON >>THE TEL AVIV SHOPPING CENTER. 04:25 I GOT ESTIMATES AS HIGH AS 700 KILLED AND THERE WAS ONLY ONE. 04:29 THERE'S NO POINT IN GOING ON WITH THIS CHARADE. 04:34 THE VIOLENT COUNTRY IN THE >>WORLD, UNFORTUNATELY IS THE U.S.
04:38 LOOK, ON NOVEMBER 6, 2004, THE CITY OF CHICAGO HAD A DAY WITH NO ONE MURDERED. 04:49 IT HAD BEEN 6 YEARS SINCE THE LAST DAY WHEN NO ONE WAS MURDERED IN CHICAGO. 04:53 I THINK IF YOU CHECK THE STATISTICS OF MURDER IN >>TEL AVIV, IT WOULD BE JUST NIL. 05:03 BECAUSE THE ISRAELIS ARE ONE FAMILY. 05:06 THEY ALL COME FROM ABRAHAM. THEY DON'T KILL EACH OTHER. THAT JUST DOESN'T HAPPEN. 05:13 THE BURGLAR WILL BE LUCKY OF THE POLICE COME AND GET HIM BEFORE >>THE NEIGHBORS DO. 05:19 IT JUST DOESN'T REALLY HAPPEN VERY MUCH. 05:22 THEY DO HAVE TERRORISM TO PUT UP WITH, BUT IT'S KIND OF DYING OFF. 05:26 THE PALESTINIANS ARE BEGINNING >>TO SEE THIS IS JUST COUNTER PRODUCTIVE. 05:32 BUT, IN AMERICA, BY GOSH, >>MY OWN CITY DALLAS IS THE MURDER >>CAPITAL OF THE UNITED STATES. 05:45 MY DOCTOR TOLD ME, "BE CAREFUL OVER THERE". 05:49 BE CAREFUL OVER HERE. >>I'VE TAKEN 80 TOURS OVER HERE. 05:53 I'VE NEVER SEEN A BREATH OF VIOLENCE. 05:56 I MEAN, IT'S OUT IN THE >>BOONDOCKS AND THINGS DO HAPPEN >>HERE, OBVIOUSLY. 05:59 BUT, THEY HAPPEN IN AMERICA, TOO, MUCH MORE IN AMERICA THAN HERE. 06:03 I'VE BEEN MAKING THIS POINT FOR >>SO MANY YEARS I'M PRACTICALLY TALKING TO MYSELF. 06:06 BUT, THE TOURISTS THAT COME WITH US AND LOOK AROUND, THEY SEE THE TRUTH OF IT. 06:12 THERE'S A LOT OF THINGS HERE WORKING VERY, VERY WELL. 06:30 BUT IT IS NOT THE EQUAL OF THIS AIRPORT. 06:36 I MEAN IT LOOKS LIKE FRANKFORT >>OR LONDON, A GORGEOUS, HUGE, MODERN AIRPORT. 06:46 YOU SOUND MUCH BETTER CALLING >>THERE FROM TEL AVIV THAN YOU DO >>ON YOUR OWN PHONE IN DALLAS. 06:54 I THINK THE PHONE PROBABLY WORKS >>BETTER HERE, WHY NOT! 06:56 THEY INVENTED THE CELL PHONE. 06:58 THEY PERFECT ELECTRONICS OF ALL KINDS. 07:01 THEY DON'T TAKE CREDIT FOR IT. >>THEY DON'T WANT CREDIT. >>THEY DON'T WANT TO BE NOTICED. 07:04 THEY DON'T WANT TO BE DISLIKED ANYMORE, BUT THEY CONTRIBUTE A >>GREAT DEAL TO THIS WORLD. 07:25 I MEAN, THE ARAB NATIONS ARE SURROUNDING THIS ONE AND THEY ARE 10 CENTURIES BEHIND IT. 07:39 IT'S OUT OF SOME 700 RESOLUTIONS >>400 SOME WERE AGAINST ISRAEL OVER THE LAST SO MANY YEARS. 08:00 AND THE PEOPLE THAT ARE THE >>CHOSEN PEOPLE ARE THE ONES THAT >>ARE GOING TO BE MARKED OUT. 08:08 THE TIME OF JACOB'S TROUBLE OR >>THE TIME OF ISRAEL'S TROUBLE. 08:30 OR THE PROMISED LAND, WE FAVOR THEIR ENEMIES. 08:34 THERE'S BUSY COMMERCE HERE, TRUCKS GOING BY AND SO ON. 08:38 WE'RE IN JAFFA ACTUALLY. 08:40 YOU KNOW WHO STOOD HERE? 08:47 AND HE PREACHED THERE AND THEY LISTENED. 08:49 IT SAYS THEY REPENTED IN SACKCLOTH AND ASHES. 08:51 EVEN THE ANIMALS WERE PUT IN >>SACKCLOTH AND ASHES AND THE KING >>OF NINEVAH REPENTED. 08:56 WE WOULD DO WELL TO LEARN FROM NINEVAH. 09:00 IN VIEW OF WHAT'S GOING ON IN THIS COUNTRY ABOUT ISRAEL. 09:05 EPISCOPALIANS ALSO ARE TALKING >>ABOUT DIVESTING. 09:10 WHAT A SHAMEFUL THING TO DO. 09:11 WHAT AN UNCHRISTIAN, SHAMEFUL THING THAT IS. 09:20 AND I'LL MULTIPLY YOU EVEN ABOVE >>YOUR FATHERS. 09:23 TEL AVIV IS A BEAUTIFUL EXAMPLE >>OF THIS MULTIPLICATION. 09:36 IT'S NOT ONLY GOING TO SURVIVE, >>IT'S GOING TO BE THE HEAD OF >>NATIONS IN THE KINGDOM TO COME. 10:54 AND I WILL GIVE YOU THE LAND OF ISRAEL. 10:57 THE WILDERNESS AND THE DRY LAND >>SHALL BE GLAD. 11:00 THE DESERT SHALL REJOICE AND BLOSSOM AS THE ROSE. 11:03 YOU SHALL KNOW THAT I AM THE >>LORD WHEN I BRING YOU INTO THE >>LAND OF ISRAEL. 11:13 WELL, COME ON WITH ME ON OUR TOUR. 11:15 YOU'LL SEE TEL AVIV. 11:16 YOUR AIRPLANE WILL LAND IN TEL AVIV. 11:27 WHEN SADDAM HUSSEIN WAS LOBBING >>THESE MISSILES AT TEL AVIV AND WE INTERCEPTED THEM. 11:33 WELL, THE STORY WENT SEVERAL WAYS. 11:40 EVERYBODY WOULD STAND, THAT WAS SOME MOMENT. 11:51 AND THAT'S A WORD THAT'S THROWN AROUND. 11:53 TELL ME SOME OF YOUR STORIES ON THAT. 12:00 ALTHOUGH THERE ARE FILIPINOS WHO ARE CHRISTIAN. 12:02 BUT, THIS IS SPECIFICALLY SAYING >>I AM A PALESTINIAN FIRST, THEN CHRISTIAN NEXT. 12:11 YOU CAN SEE SEVERAL OF THEM, >>ELIAS CHACOUR, HE WROTE A BOOK >>CALLED "BLOOD BROTHERS"
12:18 AND AS A MATTER OF FACT, >>HE WAS NOMINATED FOR AN AWARD. 12:21 OH, I READ THE BOOK. >>NOBEL PEACE PRIZE. 12:25 YOU LOOK AT WIAM, WHERE JESUS IS >>A PALESTINIAN REVOLUTIONIST. 12:29 ALL THESE TEACH THAT JESUS WAS A >>PALESTINIAN REVOLUTIONIST. 12:32 IT'S CALLED "THEOLOGY OF LIBERATION". 12:35 WHAT KIND OF BALONEY IS THAT? 12:36 NOBODY CALLED THE PLACE PALESTINE IN JESUS TIME. 12:49 THEY'RE SHOOTING AT US IN BET JALLA. 12:55 YOU DIDN'T SAY THE REST OF THE >>STORY, HALF TRUTH. 13:01 IS BECAUSE THE CHRISTIAN COMMUNITY WAS EMPTIED FROM BET JALLA. 13:08 AND THE ARMY FROM GILO WAS FIGHTING BACK AS THEY WERE FIRING AT THE ISRAELIS. 13:14 THAT THEY HAD TO BUILD TO >>INTERCEPT RIFLE BULLETS COMING >>AT THEIR APARTMENTS. 13:19 IN FACT, IT GOES MUCH WORSE THAN THAT, ZOLA. 13:26 ASKING THEM TO DIVEST FROM ISRAEL. 13:27 AT ONE POINT IN TIME IN CALIFORNIA, THERE WAS A GROUP CALLED E.M.E.U. 13:31 EVANGELICALS FOR MIDDLE EAST UNDERSTANDING. 13:33 I URGE YOU, YOUR VIEWERS NOT TO >>SUPPORT SUCH GROUPS. 13:37 THESE ARE NOT CHRISTIANS. 13:38 EMIL SLITA WAS THE HEAD OF THE >>PATRIARCHIC OF SCHOOLS. 13:42 THIS GUY WAS IN CHARGE OF ALL THE SCHOOLS OF "PALESTINE". 13:44 HE WAS THERE AS TALKING PEACEFUL >>THINGS, RIGHT. 13:48 AND I REMEMBER RUNNING OUTSIDE >>AFTER HE FINISHES HIS SPEECH. 13:52 I GOT IT ON TAPE. 13:52 I SAID I DON'T UNDERSTAND, YOU'RE SAYING THAT YOU'RE A MAN OF PEACE. 13:59 YOU DRESSED UP IN A LAPEL. 14:00 I WENT TO YOUR SCHOOLS WHEN I WAS YOUNG AND YOU TAUGHT ME LIBERATION THEOLOGY. 14:04 YOU TAUGHT ME TO HATE ISRAEL. 14:05 I SAID, WHAT DO YOU THINK WE SHOULD DO TO ISRAEL. 14:07 HE SAYS, ISRAEL SHOULD BE ELIMINATED. 14:10 THAT'S ALL I ASKED HIM. 14:11 I SAID, BY PUTTING BOMBS IN BUSES. 14:13 HE SAID, BY WHATEVER MEANS. 14:14 I SAID YOU HAVE A LAPEL, YOU >>JUST SPOKE TO THIS PRESBYTERIAN >>CHURCH ABOUT PEACE. 14:18 YOU MEAN A COLLAR A CHRISTIAN COLLAR. 14:20 YES, AND HE WAS EMIL SILTA, >>THE HEAD OF PATRIARCHIC SCHOOLS >>OF "PALESTINE"
14:25 AND THERE HE IS CONDONING BOMBS IN BUSES, KILLING CIVILIAN ISRAELIS. 14:33 WHAT OTHER NATION EVER SAYS, WE NEED TO ELIMINATE THE NEXT PEOPLE OVER. 14:44 WE OUGHT TO GET RID OF CANADA, >>THEY CRITICIZE US OR MEXICO? 14:47 I MEAN, NOBODY IN THE WORLD SAYS >>THIS EXCEPT PALESTINIANS. 14:54 AND GO AND KILL CHILDREN AND CIVILIAN. 14:57 HANAN ASHRAWI WAS A CHRISTIAN? >>GEORGE HABASH IS A CHRISTIAN? 15:01 THAT DOESN'T MAKE ANY SENSE. 15:05 IF HE KILLED CIVILIAN SCHOOL >>CHILDREN AND ALL THESE THINGS? 15:11 AND HAMAS IS AND INTRICATE FACTION OF THE PALESTINIAN AUTHORITY? 15:18 WELL, THEY ARE FRIENDS WITH PRESBYTERIAN USA PEOPLE. 15:24 I CALL THEM ISLAMISTS IN CHRISTIAN GARB. 15:27 REALLY WOLVES IN SHEEP'S CLOTHING. 15:33 THE JEWISH NATION, ISRAEL AS A NATION HAS THE RIGHT TO EXIST. 15:39 YOU RARELY EVER HEAR IT. 15:39 EVEN CONVERTS TO CHRISTIANITY FROM MUSLIM BACKGROUND HAVE A HARD TIME WITH ISRAEL. 15:47 ONE OF 5 OR 6 NATIONS THAT HAVE >>PUT UP A SATELLITE. 15:50 THEY INVENTED THE CELL PHONE. 15:54 AND WE'RE TALKING ABOUT A BUNCH OF 10TH CENTURY DEFUTALIST NOT GIVING THEM THE RIGHT TO EXIST. 16:03 I MEAN, WHAT ARE WE TALKING ABOUT? 16:08 THEY SAY WELL YOUR MESSAGE LACKED HOPE. 16:10 I SAY, WELL, YOU HAVE HOPE, AMOS 9:15. 16:17 SECOND OF ALL, WHAT ARE YOU WORRIED ABOUT? 16:22 THE G.D.P. GROSS DOMESTIC PRODUCT, DOES NOT EQUATE TO CALIFORNIA. 16:28 IS THAT WHAT YOU ARE WORRIED ABOUT? 16:30 THEY'RE NOT AS STRONG ECONOMICALLY. 16:33 NOT AS STRONG, THEY ARE VERY WEAK. 16:35 BUT, THEY ARE JUST INTERESTED IN MILITARY ARAB AGGRESSION. 16:38 SO, YOU HAVE NOTHING TO WORRY >>ABOUT IF YOU HOLD TO YOUR LAND. 16:41 DON'T DIVIDE YOUR LAND, BECAUSE JOEL CONDEMNED DIVIDING THE LAND. 16:50 THE TREATMENT OF THE BRETHREN EXACTLY MATCHES. 16:55 FOR I WAS HUNGRY, I WAS IN PRISON. 17:07 IMPRISONED JEW LIVING IN GHETTOS. 17:08 FOR ALL THESE YEARS, THE ESSENCE >>AND EVIDENCE FOR OUR FAITH IS >>OUR LOVE TO THE JEWISH PEOPLE. 17:40 BUT HOW IN THE WORLD DO AMERICANS COME TO THIS? 17:46 ONE WORD CONVINCED ME OF THE >>BIBLE AND THAT WORD IS "ISRAEL". 17:53 ISRAEL, THAT WORD IS ISRAEL. 17:55 I WASN'T THERE WHEN JESUS WAS CRUCIFIED, ZOLA. 17:58 I WAS THERE IN THE SIX DAY WAR. >>I SAW IT IN MY OWN EYES. 18:02 I WAS THERE IN THE YOM KIPPUR WAR. I SAW ALL THIS. 18:07 AND THEY OPENED UP THE STORES TO FEED THE ARABS IN THE SIX DAY WAR. 18:11 IT WAS CALLED THE SIX DAY WAR. 18:13 I WAS ASTONISHED, MY MOTHER WAS RIGHT. 18:14 IT WAS SIX DAY WAR, ON THE >>7TH DAY JERUSALEM WAS PROCLAIMED >>ETERNAL CITY FOR ISRAEL. 18:23 THE BATTLE OF JOSHUA OVER JERICHO IS A SIX DAY WAR. 18:30 EARLY IN THE MORNING, LOOK AT THE TEXT. 18:31 THIS IS WHY I SAY, NOT ONE JOT, >>ONE TITTLE SHALL GO AWAY. 18:37 ALL WILL BE FULFILLED. 18:50 LIKE RAIN AND WE HAD A MESSIANIC ERA. 18:52 WHAT IS THE PROBLEM OF THE WORLD >>THINKING OF US APOCALYPTIC? 18:56 THEY SAY, OH THE CHRISTIANS, THEY BELIEVE IN APOCALYPSE. 18:59 THERE WILL BE A MESSIAH WHO WILL BRING PEACE, WHO WILL HELP US IN >>AN INVASION TO DESTROY US. 19:06 THIS IS SELF-DEFENSE WAR. 19:07 I STARTED REALIZING AS I STARTED STUDYING THE BIBLE THAT ISRAEL >>HAS A SELF-DEFENSE WAR. 19:12 THERE IS NO PROBLEM WITH PEOPLE >>BELIEVING IN SELF-DEFENSE. 19:14 THE PROBLEM IS THE ATTACK WAR FROM ALL THE NATIONS THAT SURROUND ISRAEL. 19:19 NOBODY SPEAKS ABOUT THAT. 19:20 WHY CAN'T THE PEOPLE WHO KEEP ON >>TRYING TO FIND SOME MAGIC >>SOLUTION TO PEACE, UNDERSTAND? 19:30 TOMORROW MORNING, >>NO PALESTINIAN WILL LEAVE HOME >>TO KILL AN ISRAELI. 19:35 NEXT DAY, SAME THING. 19:36 THERE WILL BE PEACE 1000 YEARS >>IF THEY WILL DO THAT. 19:39 THAT'S THE PROBLEM, THERE'S SIMPLY MURDERERS. 19:42 IT'S NOT A WAR. 19:43 THERE'S NO ARMY AND NAVY ON ONE >>SIDE, IT'S JUST MURDERERS. 19:51 THE POLICE GO OUT AND GET THEM >>LIKE THE ISRAELIS DO. 19:54 THAT'S ALL THAT'S GOING ON. 19:58 OR SOME BATTLE FOR INDEPENDENCE, >>IT'S RIDICULOUS. 20:03 YOU SAY "PRAY FOR THE PEACE OF JERUSALEM". 20:07 I STARTED LEARNING THE JEWISH SONGS. 20:13 HE DOES NOT SLEEP, NOR SLUMBER, >>THE ONE WHO WATCHES OVER ISRAEL. 20:25 SHARPEN MY BONES, SHARPEN THEM >>AND MAKE THEM SWORDS. 20:28 MAKE MY BODY, (SPEAKING ARABIC) INTO A MOLOTOV COCKTAIL. 20:33 (SPEAKING ARABIC) ALL JEWS ARE KILLERS. YOUR BLOOD IS KOSHER TO US. 20:39 WE KNOCK ON THE GATES OF HEAVEN >>WITH THE SKULLS OF JEWS. 20:45 BY KILLING JEWS WE ENTER PARADISE ALL OF A SUDDEN. 20:49 WHY KILLING OURSELVES MAKES US >>ENTER INTO PARADISE? 20:53 WE SACRIFICE OUR OWN SELF. 20:54 IT'S BY YOUR OWN SACRIFICE YOU >>WILL ENTER HEAVEN. 21:00 THAT WILL MAKE US GO TO HEAVEN >>AND THAT'S WHAT I FOUND OUT. 21:04 IT WAS THAT SACRIFICE THAT WAS >>OFFERED ON OUR BEHALF. 21:07 GO ON AND TELL ME YOUR TESTIMONY. 21:08 HOW DID YOU REALLY FIND THAT OUT? 21:12 I PRAYED TO THE GOD OF ABRAHAM, >>ISAAC AND JACOB TO SHOW ME THE TRUTH. 21:20 AND I THOUGHT FOR SURE THE KORAN WILL HAVE MORE WEIGHT. 21:27 AND I CAN TELL BY THE WAY YOU TALK AND THE WAY YOUR BIBLE IS MARKED. 21:39 BECAUSE I THOUGHT THE BIBLE WAS CORRUPTED. 21:40 I FOUND THE BIBLE WAS SPEAKING >>OF THE GOOD, THE BAD AND THE UGLY. 21:45 NO MATTER WHAT YOU ARE, IT SHOWS WHAT YOU REALLY ARE. 21:48 IF DAVID SINNED, IT WAS THERE. 21:49 IN THE KORAN, THERE WAS A STORY OF MOHAMMED MARRYING HIS ADOPTED >>SON'S WIFE, ZAYED. 21:57 SO, HE TOOK HIS ADOPTED SON'S WIFE AND MARRIED HER. 22:01 SO, THAT WAS NOT CONDEMNED AS A >>SIN, BUT IT WAS CONDONED AS A >>GOOD THING SO IT WAS NO PROBLEM. 22:11 HIS OWN ADOPTED SON'S WIFE. 22:13 I HAVE A PROBLEM WITH THOSE THINGS. 22:18 I FOUND SO MUCH SCIENCE IN THE BIBLE, >>SO MUCH PROPHECY IN THE BIBLE. 22:22 I SAW MY LIFE DURING THE SIX DAY WAR. 22:25 I SAW MY LIFE DURING THE YOM KIPPUR WAR. 22:26 I SAW MY LIFE TERRORIZING ISRAEL >>AND I KNEW THAT I WAS GOING AGAINST GOD HIMSELF. 22:34 I WAS FACE TO FACE WITH GOD ALMIGHTY AT THIS POINT. 22:37 AND THEN I REMEMBER, OH, >>WHAT I SAID WAS, OKAY, COME IN. 22:41 I DIDN'T SAY MUCH, JUST COME IN, MESSIAH COME IN. 22:44 IT REMINDS ME FOR THE THIEF THAT >>WHO WAS ON THE RIGHT HAND AND THE LEFT HAND. 22:49 HE DIDN'T SAY MUCH. >>HE DIDN'T SAY MUCH. 22:50 HE SAID, REMEMBER ME WHEN YOU GO >>TO YOUR FATHER'S HOUSE, THAT'S ALL. 22:55 REMEMBER ME. HE DIDN'T TOTALLY UNDERSTAND. 22:58 THE WOMAN TOUCHED HIS GARMENT, >>SHE WAS HEALED. 23:03 HIS YOKE IS EASY, IT'S SO EASY. 23:06 IT DOESN'T TAKE MUCH, BUT I JUST >>MADE THAT PRAYER "COME IN". 23:17 I COULDN'T FIGURE OUT THE JOY THAT I HAD. 23:19 IT WAS SO MUCH JOY. 23:20 I DIDN'T TALK TO ANY CHRISTIAN. 23:22 THERE WAS NOBODY WITNESSING TO ME. 23:23 LISTEN, WALID, WOULD YOU DO WHAT >>BROTHER ZACH DID WHEN HE WAS HERE? 23:32 AND HE GAVE THEM A TESTIMONY, A WITNESS. 23:36 WOULD YOU DO THAT? >>SURE. 24:14 I ONLY UNDERSTOOD THE LAST WORD. >>THANK YOU. 24:19 I DON'T KNOW IF THEY'LL GET IN >>TROUBLE ABOUT THIS OR WHAT. 24:24 I GET A LOT OF TROUBLE, OF COURSE. 24:27 I MEAN, MORE FROM THE JEWS THAN >>THE CHRISTIANS. 24:34 YOU'RE GOING TO GET SHOT AT NOW AND THEN. 24:35 WELL, MUSLIMS SHOULD NOT HAVE A PROBLEM DIALOGING WITH LOOKING >>AT THE ISSUES. 24:41 BECAUSE THEY SAY THAT JESUS WAS >>NOT CRUCIFIED. 24:44 NO MUSLIM BELIEVES JESUS WAS CRUCIFIED EXCEPT THE AMMANS. 24:47 THEY BELIEVE, MANY OF THEM >>BELIEVE THE BIBLE WAS CHANGED. 24:51 WE DON'T GET ANGRY, WE DON'T GET UPSET. 24:54 SO, I THINK THE ISSUE OF FAITH >>AND RELIGION IS AN ISSUE OF ONE'S OWN SEAbCH. 25:01 I DID THAT RESEARCH AND I WENT >>TO A SELF-DETOXIFICATION PROGRAM. 25:07 I REALIZED THAT THE WHOLE ISSUE IS THE SECOND OLDEST PROFESSION >>IN HISTORY, ANTI-SEMITISM. 25:13 THAT'S WHAT IT BOILS DOWN TO, ANTI-SEMITISM. 25:15 AND WHEN MESSIAH COMES, HE'S >>GOING TO JUDGE THE NATIONS BASED >>ON ONE THING, ANTI-SEMITISM. 25:21 WHY DO THE PEOPLE DISLIKE THE JEWS, WHY IS THERE ANTI-SEMITISM? 25:33 AND GOD PUTS UP A REPRESENTATIVE >>JOB, HE SAID, HAVE YOU CONSIDERED MY SERVANT JOB. 25:41 AND THE DEVIL SAYS, JOB IS RICH. 25:43 TAKE AWAY WHAT HE HAS AND HE'LL >>CURSE YOU TO YOUR FACE. 25:44 POOR JOB, HE'S LIKE THE CHOSEN PERSON AND GOD TAKES AWAY WHAT HE HAS BUT HE DOESN'T CURSE HIM. 25:51 HE SAYS, YE THOUGH HE SLAY ME, >>YET WILL I TRUST HIM. 25:55 ZOLA, THANK GOD YOU WERE CHOSEN. 26:00 FOR ALL THESE THOUSANDS OF YEARS? 26:03 THANK GOD YOU WERE CHOSEN. 26:04 I CAN SIT DOWN WITH A RABBI AND HE HAS TO OBSERVE KOSHER AND ALL THESE LAWS. 26:10 I SAID THANK GOD YOU WERE CHOSEN. 26:11 IT'S NOT A REAL BLESSING FROM A WORLD SENSE. 26:20 AND THE BIBLE IS A LIGHT TO THE GENTILES. 26:25 IF WE WILL ONLY ALLOW THEM TO BE >>A LIGHT TO THE GENTILES. 26:28 WALID, I APPRECIATE YOU COMING. 26:29 GET IN TOUCH WITH THE GUY. SHOEBAT.COM. 26:35 HE'S GOT A BOOK, "WHY I LEFT JIHAD". 26:37 HE'S AVAILABLE TO SPEAK AT YOUR CHURCH. 26:40 IT'S WONDERFUL TEACHING, VERY FRESH, VERY NEW. 26:42 I'VE NEVER HEARD A MUSLIM GUY TEACH OUT OF THE SCRIPTURE LIKE THIS. 26:47 AND SHA'ALU SHALOM YERUSHALYIM, PRAY FOR THE PEACE OF JERUSALEM.